Interested in a Candy Experiments school visit in the Seattle area? I give class presentations, hands-on class workshops, large school presentations, and science fair tables, as well as events in bookstores, museums, and libraries. I've handled groups ranging from just a few children to thousands of children at the USA Science and Engineering Festival in Washington DC. A presentation of candy experiments which I do in front of a group, suitable for classrooms, assemblies, or book signings. Hands-on opportunities for volunteers. Hands-on workshops in which I lead the class in trying experiments. Every student receives materials to do all the experiments. An experiment booth, suitable for a school science fair or other large group, in which I demonstrate hands-on experiments to eager passers-by. This is the format we use at the USASEF in Washington DC, where we have been able to reach out to thousands of excited children. 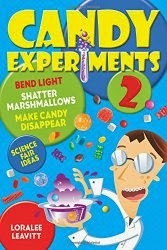 A classroom presentation on writing, focusing on the process of developing and publishing the candy experiments book, or adapted to include the writing topic of your choice, with a few candy experiment demonstrations included. Contact me to learn more about presentations and rates.